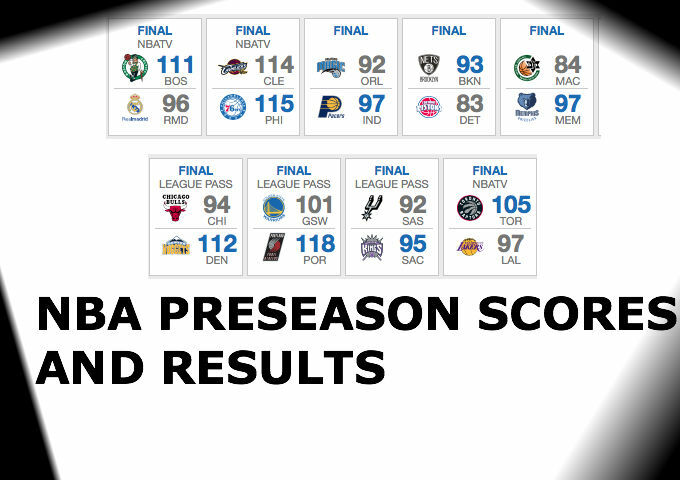 MIAMI, Fla., Sporting Alert – The NBA preseason scores from the games that were played on Thursday, October 8. Check out all the brief recaps and scores on the day. MADRID, Spain — Avery Bradley scored 17 points and David Lee collected a double-double and the Boston Celtics beat Real Madrid 111-96 on Thursday night to end their two-game European tour undefeated. Bradley shot 7-of-14 from the field, including 3-of-4 from three-point range, while Lee finished with 13 points, 11 rebounds and four assists. Isaiah Thomas had 15 points and Terry Rozier added 14 for Boston, which shot 42.7 percent from the floor as a team. Trey Thompkins, the former Los Angeles Clippers center, led the way for Real Madrid with 21 points and eight rebounds, with Sergio Llull and Felipe Reyes scoring 15 points each in the defeat for the Spanish side. Sergio Rodriguez had 13 points and Andres Nocioni ended with 11 for Real Madrid, who trailed by as many as 25 points during the contest and were held to just 37.6 percent from the field. PHILADELPHIA — Jerami Grant scored 19 points off the bench and the Philadelphia 76ers rallied from a 19 point deficit to down the Cleveland Cavaliers 115-114 in preseason on Thursday. Scottie Wilbekin made the winning 3-pointer with 1.3 seconds left. It was is only shot in his three-minutes of playing time on the night. Isaiah Canaan scored 16 points and Jahlil Okafor and Robert Covington had 12 points each for the 76ers. Nerlens Noel collected 10 points, 15 rebounds and three steals in the win. Jared Cunningham led the Cavs with a game-high 31 points on 8-of-10 shooting, while Matthew Dellevedova added 13 points and five assists. LeBron James, Kyrie Irving, Kevin Love, J.R. Smith and Timofey Mozgov all sat out the game. PORTLAND — Allen Crabbe scoreD 25 points off the bench and Damian Lillard added 22 points, six rebounds and three assists and the Trail Blazers beat the defending champion Golden State Warriors 118-101 in a preseason game. Crabbe, who shot 9-of-12 from the floor, hit five of his six 3-point attempts and played for 25-minutes. Stephen Curry, who fouled out in the opening preseason game, scored 30 points and seven assists in 26 minutes for the Golden State Warriors in the loss, and sat out the fourth quarter. The NBA MVP hit six 3-pointers in the defeat. Draymond Green and Klay Thompson both scored 14 points for Golden State. ONTARIO, Calif. — Kyle Lowry returned to the lineup to score 25 points and the Toronto Raptors picked up a 105-97 preseason win over the Los Angeles Lakers on Thursday night. DeMarre Carroll collected 18 points and six rebounds, Cory Joseph also scored 18 points off the bench and Jonas Valanciunas finished with 10 points for the Raptors (2-1). Lou Williams was again the leading scorer for the LA Lakers with 19 points in 24 minutes against his former team, while Julius Randle added 17 points, five rebounds and three assists. Kobe Bryant played 22 minutes and scored 16 points on 5-of-11 shooting. Lakers rookie guard D’Angelo Russell sat out the contest with an injury.